From the outset, I have to admit the title is misleading in as much as the old men did the whole trip and loved it. 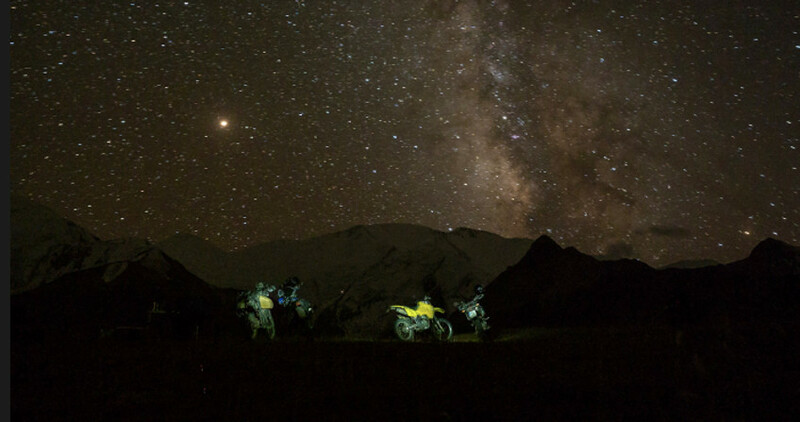 However, the idea of the title came to me as we approached the Wakhan Corridor by the Afghan border, and I’m not changing it now. The trip came about following a conversation with a good mate Dave Hall. 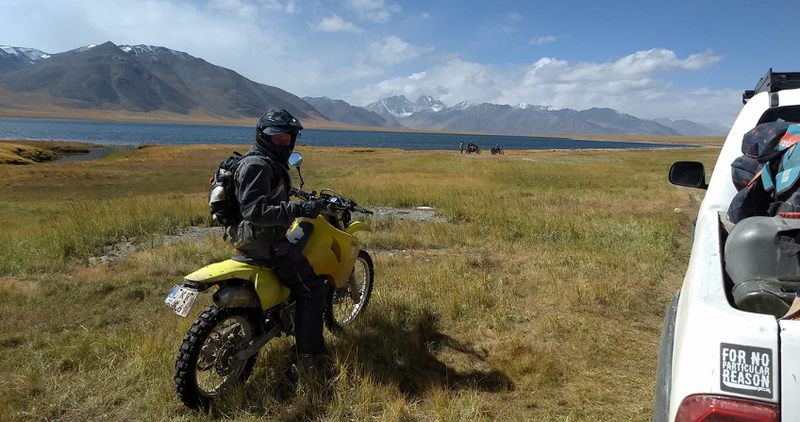 He is a very experienced rider who has guided people on tours of Europe and Morocco for BMW. 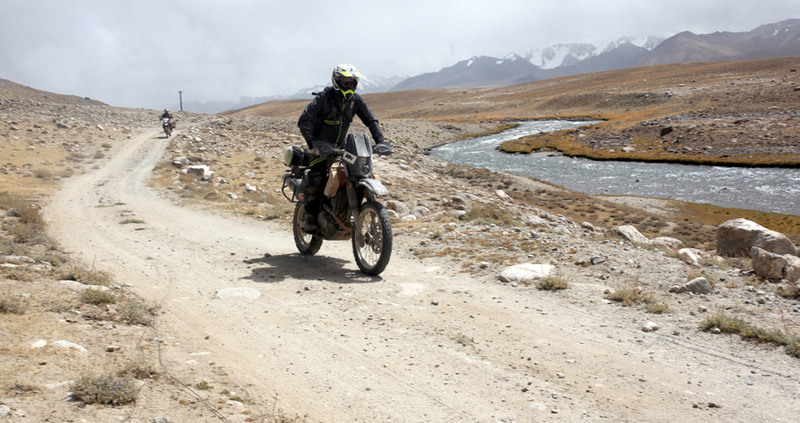 He had been on a trip to the Himalayas in India on Royal Enfield Bullets with a company called Advfactory. Dave waxed lyrical about the trip and suggested that he would be happy to go again. Would I want to go? “Certainly,” said I. “If you say it’s a good trip, count me in”. Several months went by and another call from Dave. Dates don’t work for India, would I be up for Tajikistan instead? Not wanting to appear ignorant, geographically or otherwise, I readily agreed. Then looked the place up having only heard the name without knowing more than it is an ex-Soviet state. 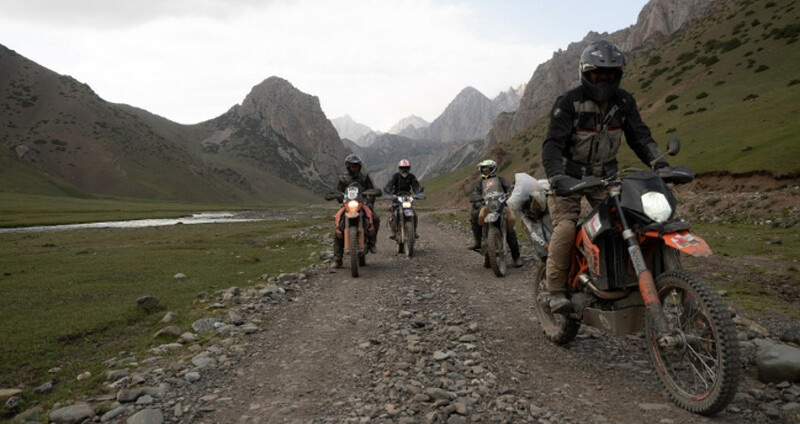 It transpired that the trip would start in Osh, the second city of Kyrgyzstan, head south to Tajikistan, ride about for a week or so, then head back to Osh. 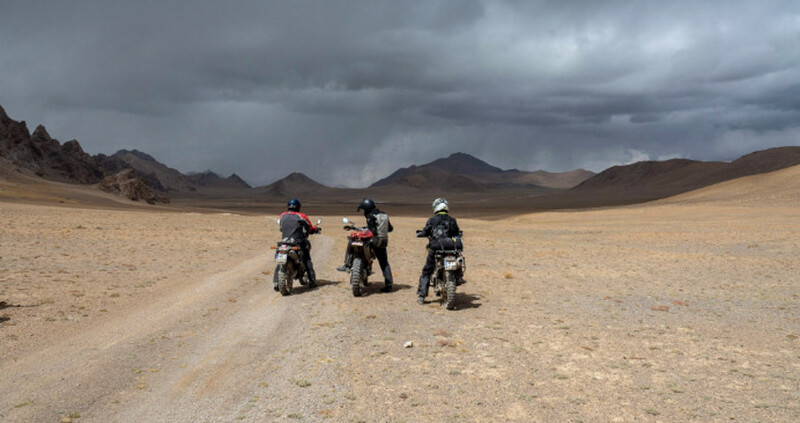 The ‘riding about for a week or so’ was a little more structured, but the exact itinerary had to be fluid depending on our ability, weather etc. A 4x4 would always be behind us carrying luggage, camping stuff, food, tools etc. It was not to be all camping as there are Guest Houses along the way. 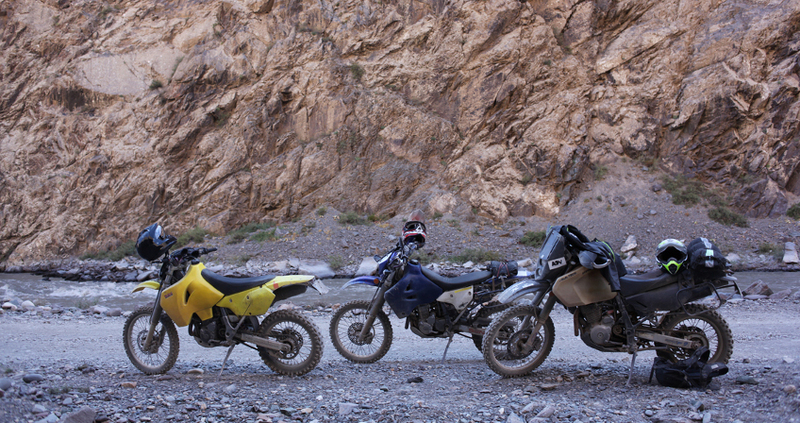 The trip would be 80% off-road and 11 days riding in total, which suited me fine. A group was gathered, people were in, people were out. 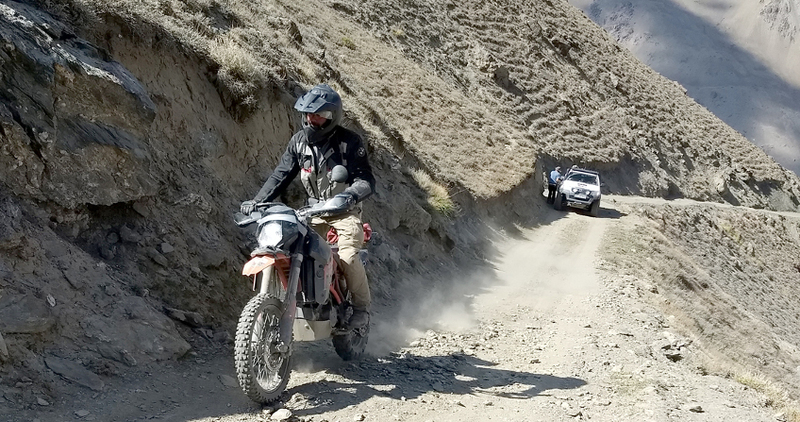 In the end, there were seven of us, including Chip who would be in the 4X4 as part of the support crew along with Krzysztof, whose company Advfactory is, and Steve the mechanic. 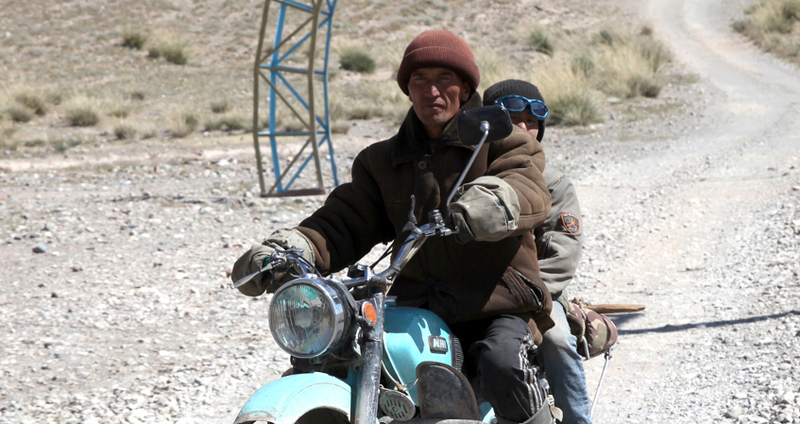 Both of these guys know a vast amount about running these trips, having ridden and guided people all over the world. Talking with people about our imminent destination was interesting. Many thought we were going to either Kurdistan, still a dream of Kurdish people, or Kazakhstan. 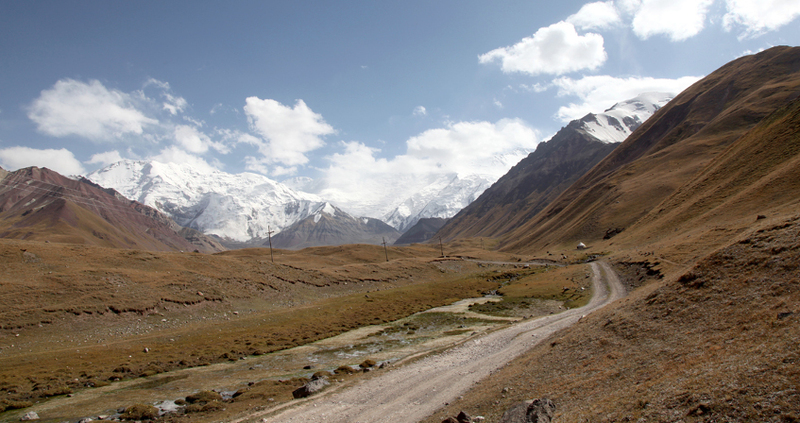 Both Kyrgyzstan and Tajikistan are smaller states bordering China, Afghanistan, Kazakhstan and Uzbekistan. They are mountainous countries with herds and flocks of sheep, goats, cattle, yaks, donkeys and horses, depending on where you are. Both states are secular, with the majority of people practising Islam. Explaining these facts would often elicit questions of why we want to go there and that we were bound to be kidnapped/shot by the Taliban/ISIS. Without wishing to spoil the outcome, we weren’t. In fact, for us, the biggest concern lay in a different direction. How would we get all our riding gear and stuff in one bag for the flights? Despite being neighbours, the two countries have significant differences. 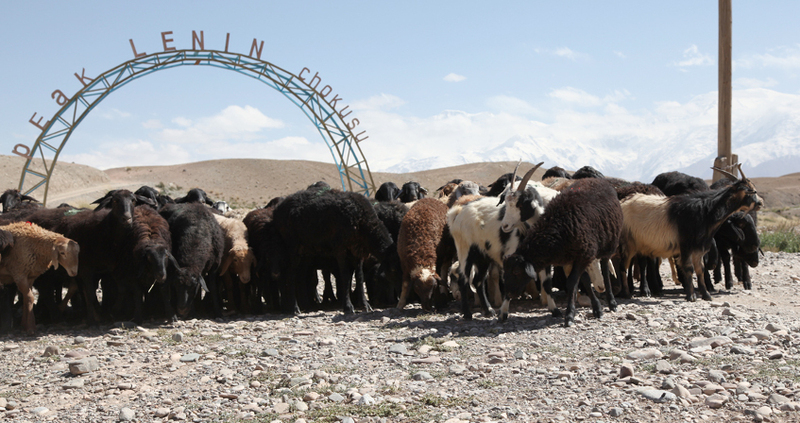 Kyrgyzstan seems more advanced, in terms of infrastructure and economics. The terrain is greener, and means the herds/flocks are moved to where the grass is greener. 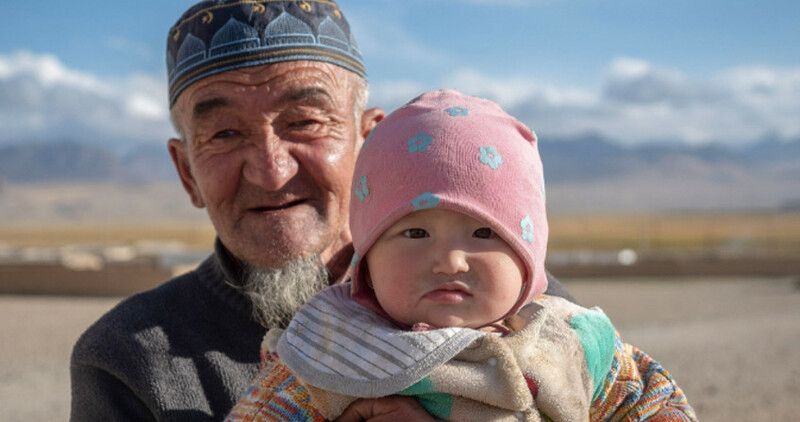 The people are more nomadic, often living in yurts. 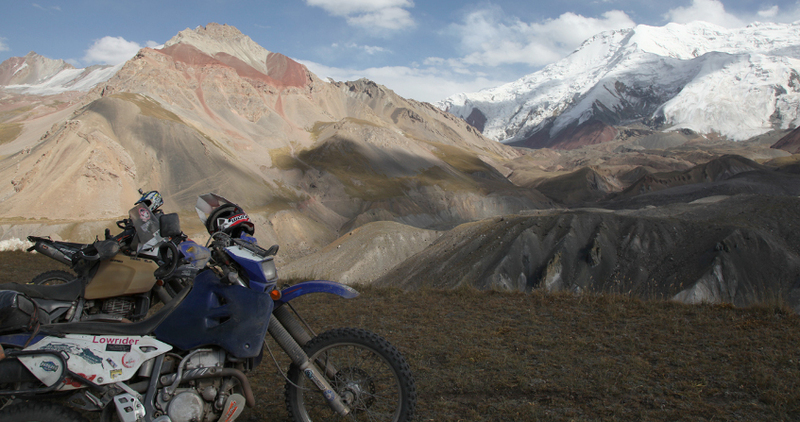 Tajikistan’s mountains are rocky and harsh. There are rivers and streams from the snow melt higher up mountains. Villages are spread far and wide, and offer small green oases in a world of rocky mountains. Altitude is a significant factor for us low-lying folk. 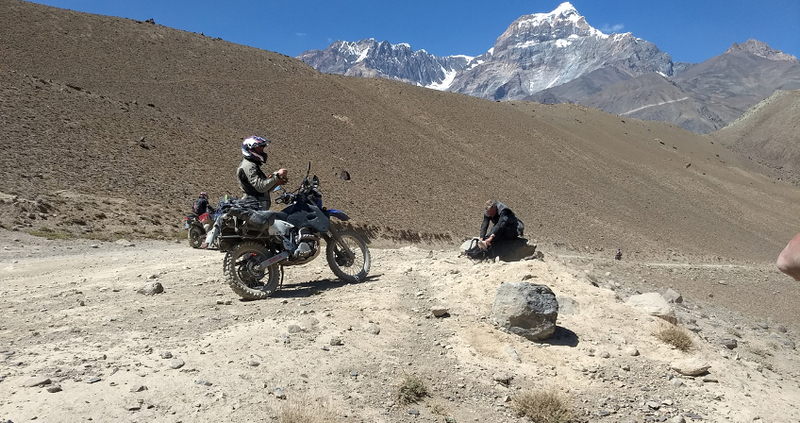 We spent a lot of time between 3000 – 4000 meters above sea level. This is a long way up and effects people in different ways. There is no way of telling who will suffer and how much. Often it is a headache that seems to come on during the night, possibly because slow, sleepy breathing means we are not getting enough oxygen. For me, it seemed to go off once the day got going. Others felt sick but fortunately weren’t. Apart from riding the bikes, everything else is very hard work. 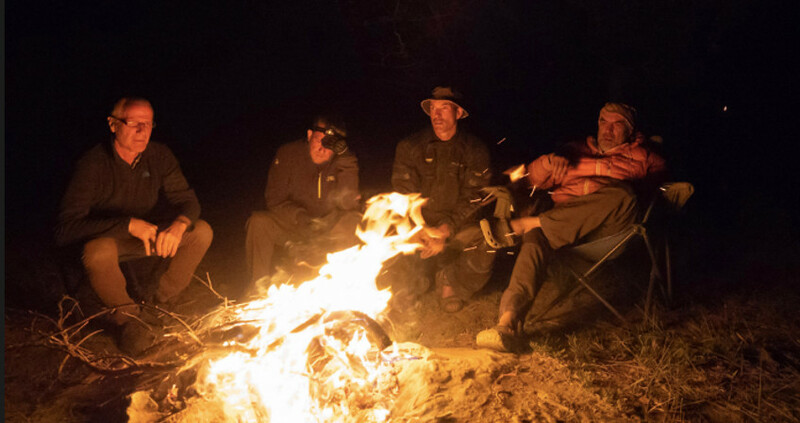 Packing tents away, putting boots on and getting sorted can be remarkably draining. 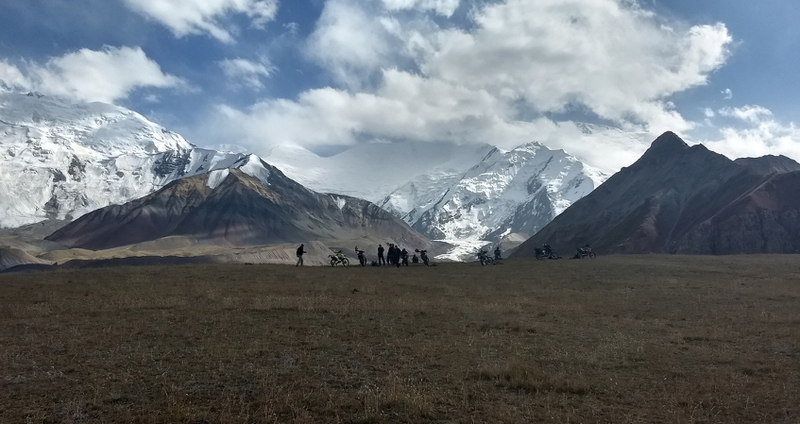 Our first experience of this was at the Base Camp for Peak Lenin, in the south of Kyrgyzstan. To get to the camp, there is a great 40km ride along trails. It leads to a wonderful view of the snow-capped peaks. 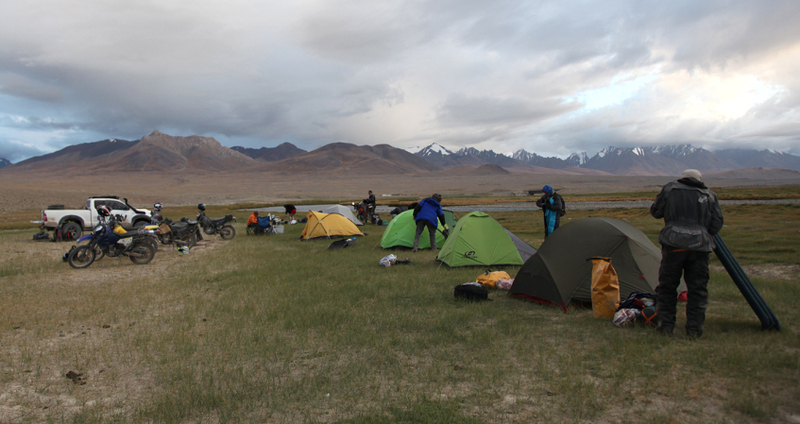 We camped in a meadow above the base camp and village. There were no climbers, as this was September and their season was over. 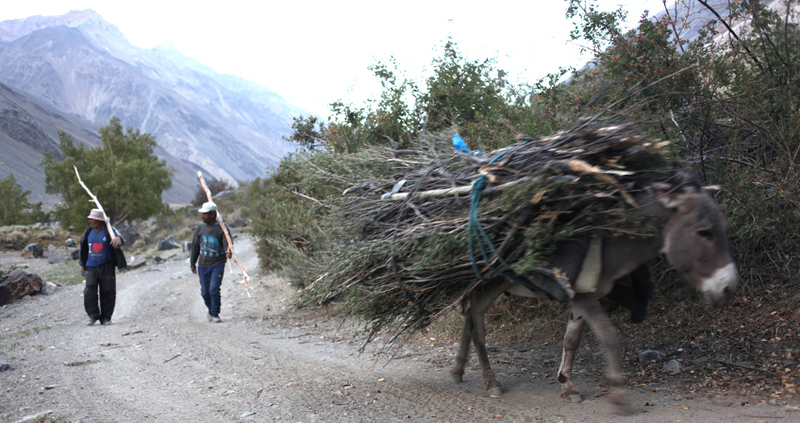 They spend many weeks at the camp, going up and down the mountain in increasing increments to get used to the altitude. 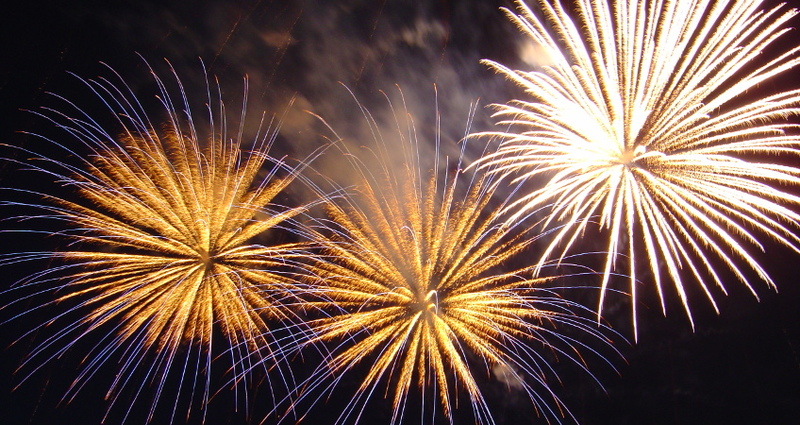 We, on the other hand, whizzed up and soon felt the effects. The sun was glorious but it soon became drastically colder when it went behind the mountain. It got down to below freezing. A few drops of condensation inside the tent turned to ice on the sleeping bag. 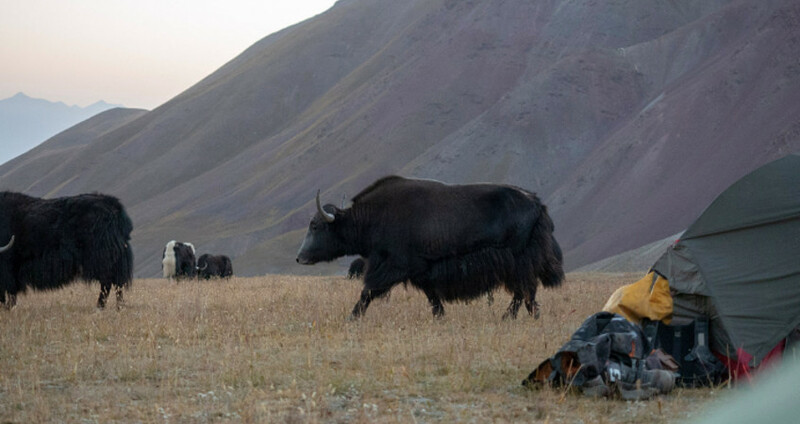 The cold, and a herd of yaks snorting their way through the camp, made for a disturbed night. We were grateful for the sun the following morning, that soon warmed up our bodies. The headache lingered, and would come and go over the next several days. 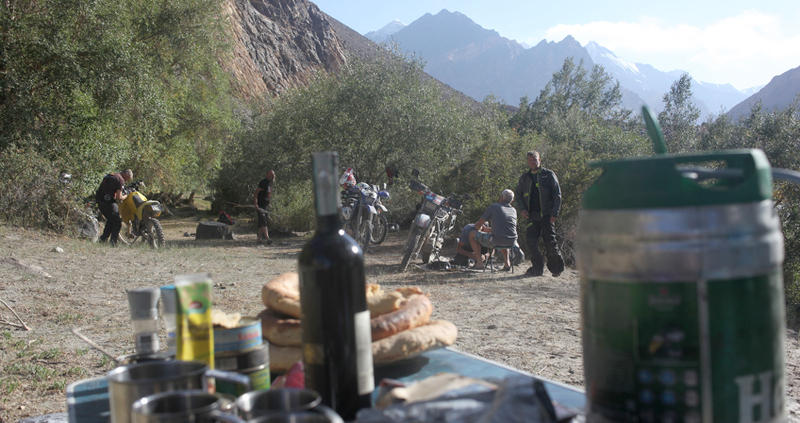 The following day, we were off over the mountain to Tajikistan. 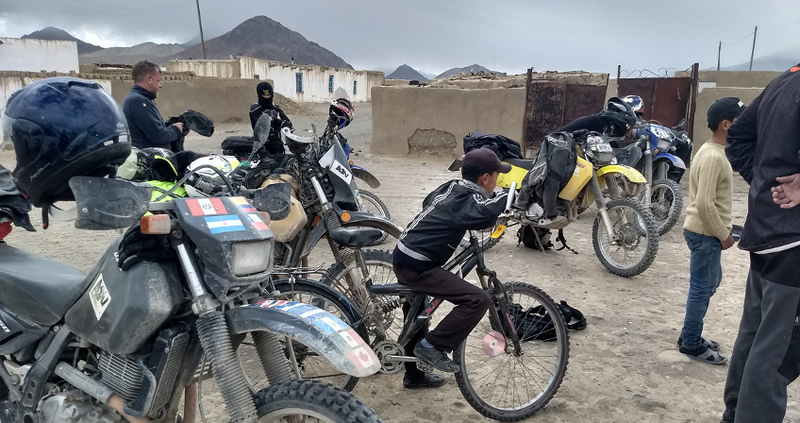 But before we did, we returned to the small town of Sary Tash, to fill up with fuel and lunch. However, when we got to the garage, there was a lorry lying on its side, with the roof of the cab resting snuggly against the diesel pump. It had clearly misjudged the corner at the bottom of the hill. 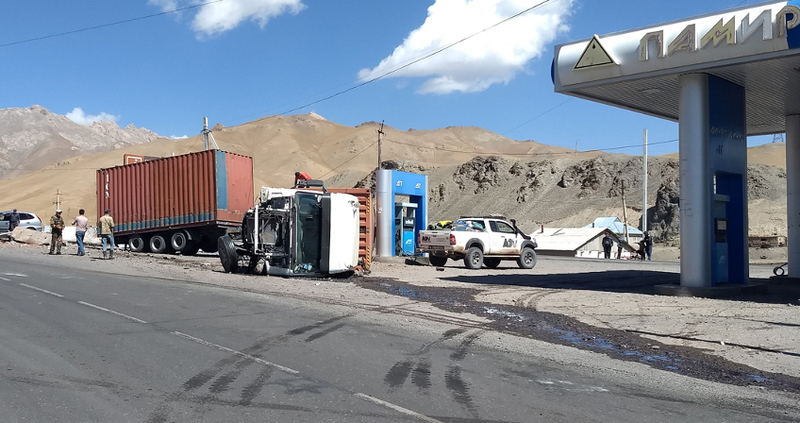 There was a stream of fuel from the stricken lorry running down the road, and half the town was looking on. The driver was fine and, more surprisingly, the young guy running the garage was still filling up his customers' vehicles. After we filled up in disbelief, we went off for some lunch. 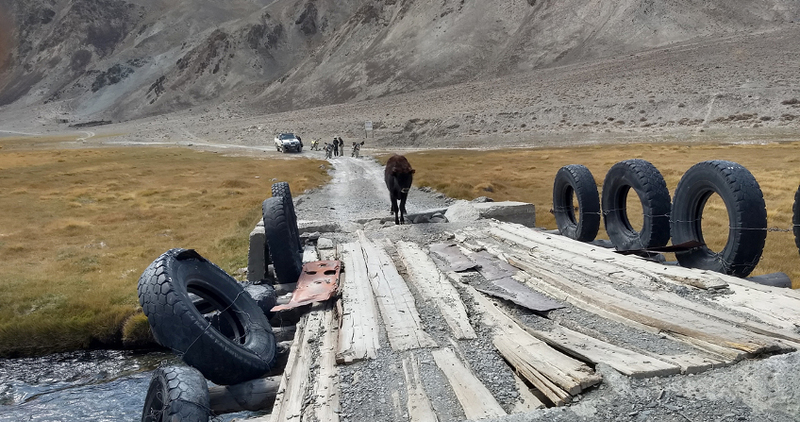 An hour or so later and the local people had organised another lorry to pull the stricken one upright, and the remains were towed away. Only the diesel pump in the garage was closed during the operation! 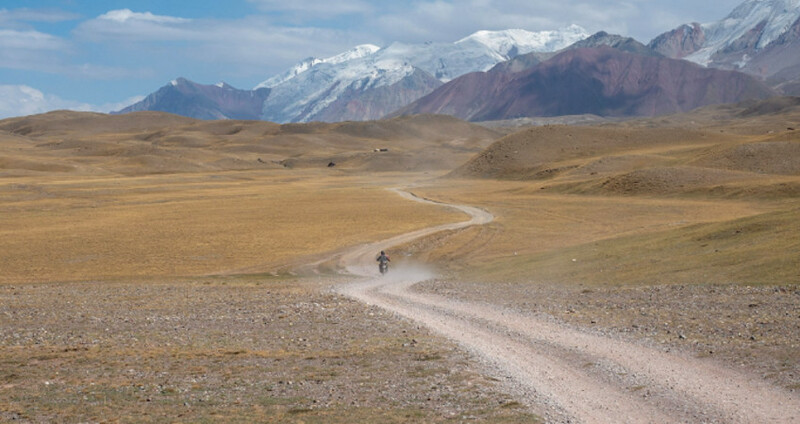 Once we had crossed a huge green valley, the potholed border road goes to the Kyrgyzstan border. 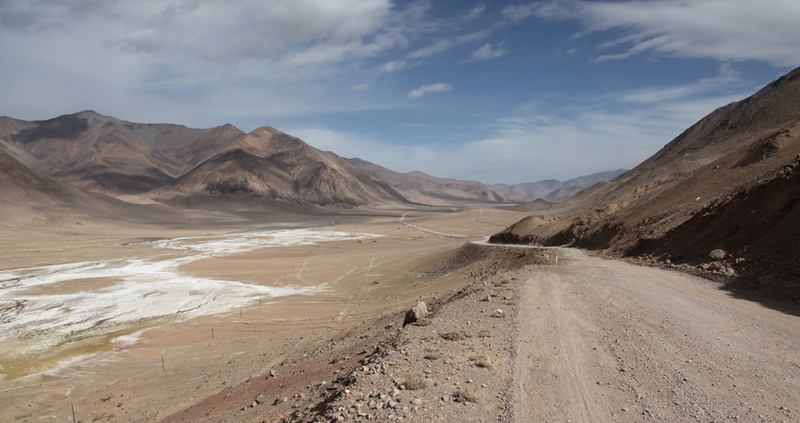 After presenting passports, there is 20km of unmade/broken road through No Mans Land that climbs up to a 4600m pass. Shortly after, there is the desolate Tajikistan border post. The world has changed in that we are well above the tree line and all is rock. Lots of rock. But there is also water. Streams rush down the mountainside, crossing the tracks that require a degree of care. 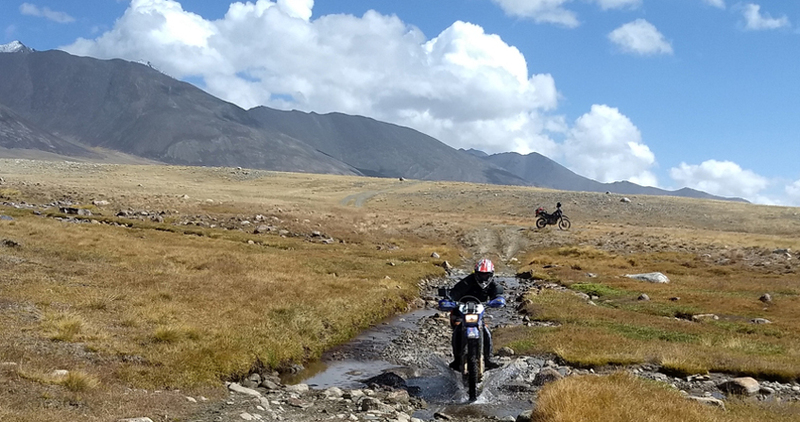 Over the trails, during the rest of the trip, there were countless water crossings - some quite deep, fast and furious; necessitating getting off and walking through with the bike. 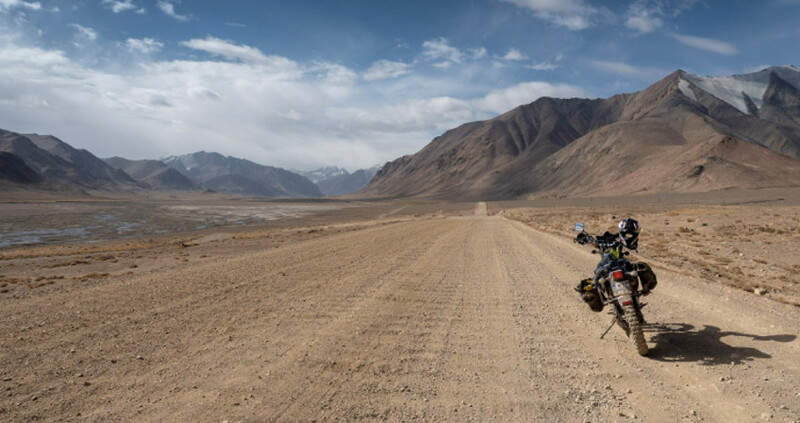 We headed for the Wakhan Corridor, a thin stretch of land in the historically sensitive area where China, Afghanistan, Pakistan and Tajikistan come very close together. It is part of an ancient trade route. The area was created as a buffer zone back in the 1870s, by two empires vying for power in the region. It was known as “The Great Game”. Russia was one of the imperial forces. The other, you guessed it, Great Britain. 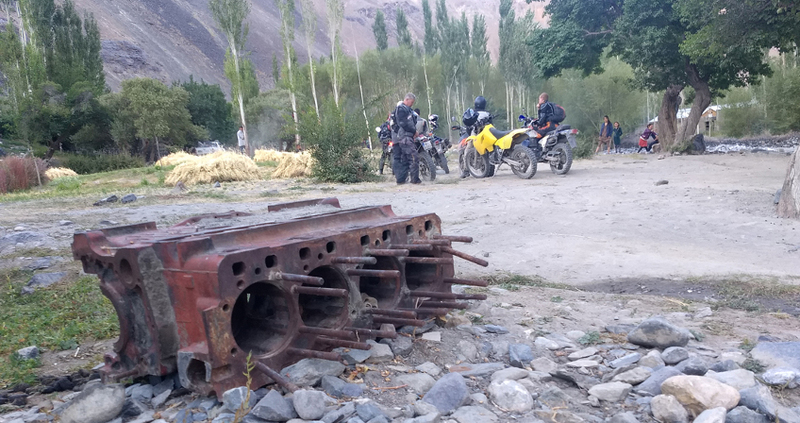 We spent two days running along the dramatic Afghan border, following the Pamir River, with the sight of snow-covered mountains reaching up to 7500 meters. 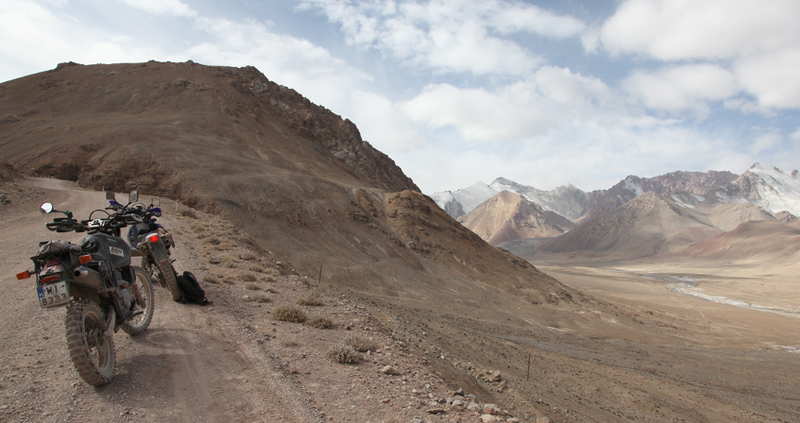 To the south, there are the high mountains of the Hindu Kush. For two evenings along the route, we were spoilt, staying in Guest Houses where sulphur hot-springs were available, a luxury for weary bones and muscles. Next, a night in the city of Khorog. We had a treat in the form of a meal in an Indian restaurant. At the neighbouring table were a group we took for local gangsters. How wrong could we be? They were professors from the university and the Minister of Education. They insisted on sharing some food that they had brought with them, roasted pumpkin stuffed with nuts and veg. Along with it came a bottle of vodka that we were also obliged to finish. The following day some of us paid the price. 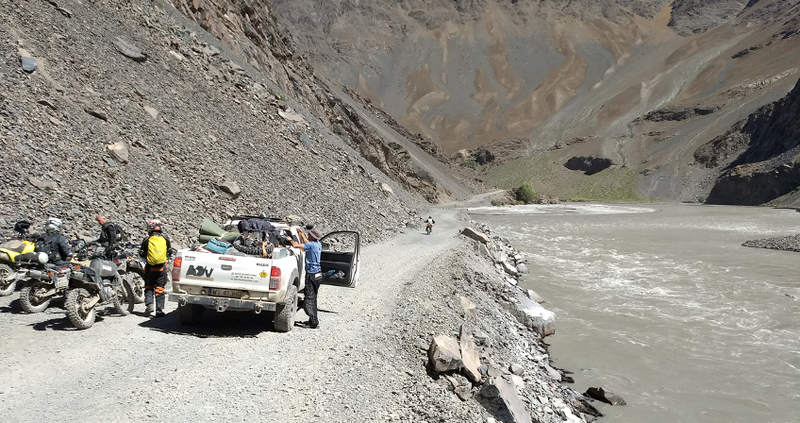 Our route now took us away from the Afghan border and into the remote Bartang Valley. The trail followed a dramatic gorge for about 100km. The destination was a small village where we were to stay the night as guests of Misha and his family, who Krzysztof has come to know from previous trips. For the people who live in these small farming communities, life has changed very little over generations. Except that, under the Soviets, there was electricity, better education for young people, and much better health provision. The older people tend to miss that period, despite the political oppression that they suffered. There are TV’s that give people a glimpse of other possibilities - when the generators are running, that is. It is a subsistence lifestyle, where families can’t afford to send their children to university. 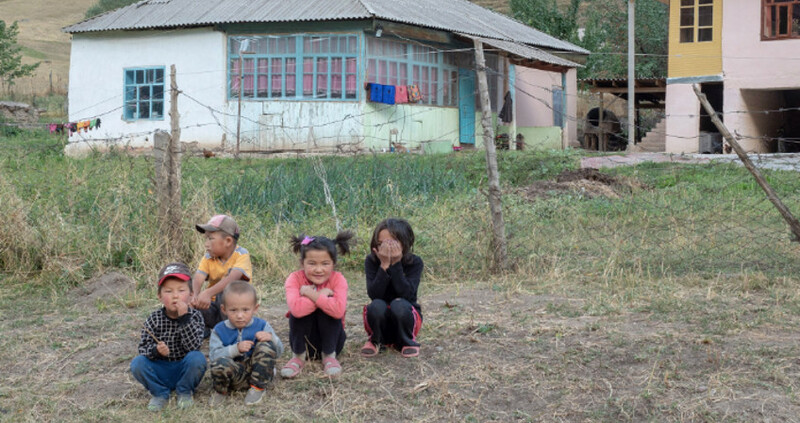 Misha’s son won a scholarship via a charitable foundation to study medicine in Khorog, but they struggle to find rent for his accommodation. It works out at $120/year!! 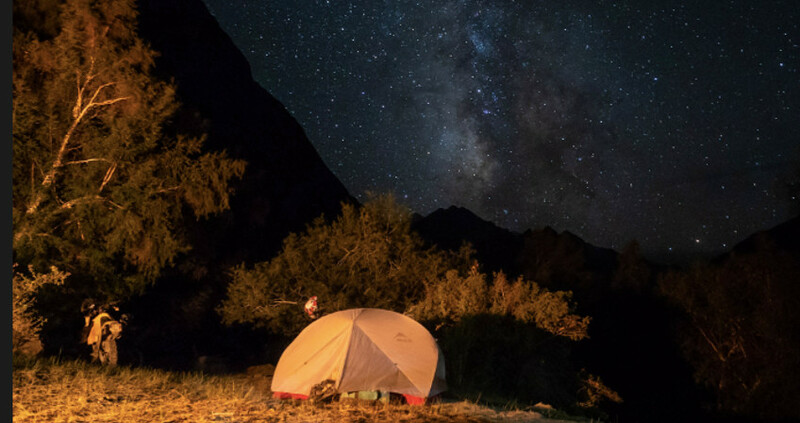 We spent the night in Misha’s garden with the canopy of stars. Clever apps on phones were pointed upwards, and were able to identify the myriad of stars and constellations. Then we were on the return stage of our large loop, but still a long way from the end of our ride. The trail wove through gorges, water crossings, over high passes and across desert-like valleys and canyons. In all honesty, it is difficult to adequately describe how dramatic and vast the landscape is. There are few trails, so getting lost was not an issue. It was great to let the riders ahead disappear into the next valley. This allowed for the experience of riding through this immense panorama on my own for mile after mile. However, it was reassuring to know there was someone following somewhere behind in a 4x4. Everywhere we went people would wave at us, mainly, but not exclusively, children. They would rush to the side of the road, often encouraged by Mums who would wave too. When we stopped in villages, the kids would gather round, immediately followed by teenagers then some adults. There were no demands for anything other than a reply to “Hello” or “Hiya”. When the 4x4 arrived, we could have a bit more discourse, as Krzysztof was able to translate. Everyone speaks Russian. There were other westerners on the road. Some doing tours in 4x4s, one group on a motorbike tour, mainly visiting significant sites. There were a few independent motorbike tourers sticking mostly to what tarmac there was. 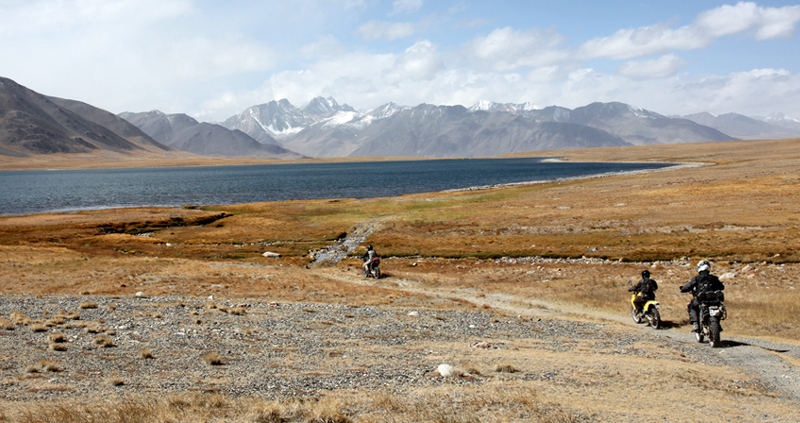 The most intrepid travellers, who appeared in the most rugged and remote places, are the cyclists. Truly a breed apart. 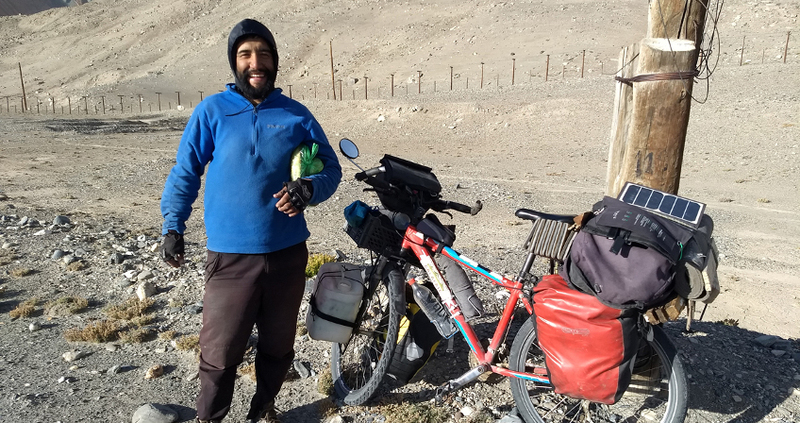 We would stop to chat with these hardy souls, who slowly progress along the highest and roughest roads on their overladen bicycles. 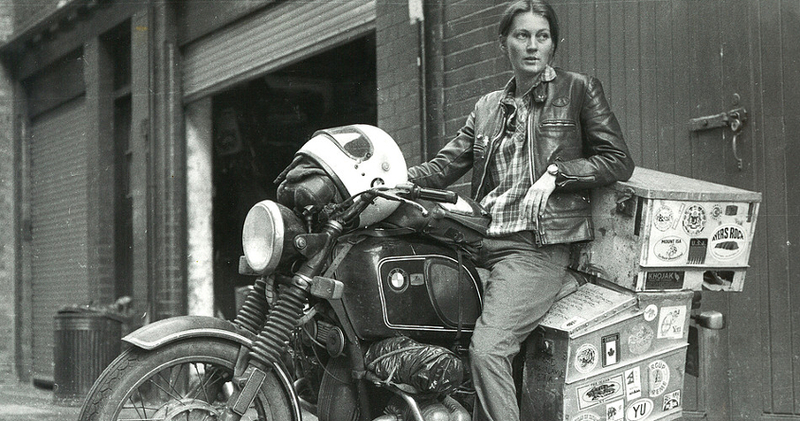 They are invariably heading for somewhere far, far away, and have been on the road for weeks, months and even years. Just about each one of them is cheery and positive. To a rider, they are completely bonkers!! I’ve been trying to think of a way of concluding, and I guess the acid test for any sort of trip is whether you would go back. I certainly would, and can’t think of why I wouldn’t. The landscape is beyond my meagre powers of description. 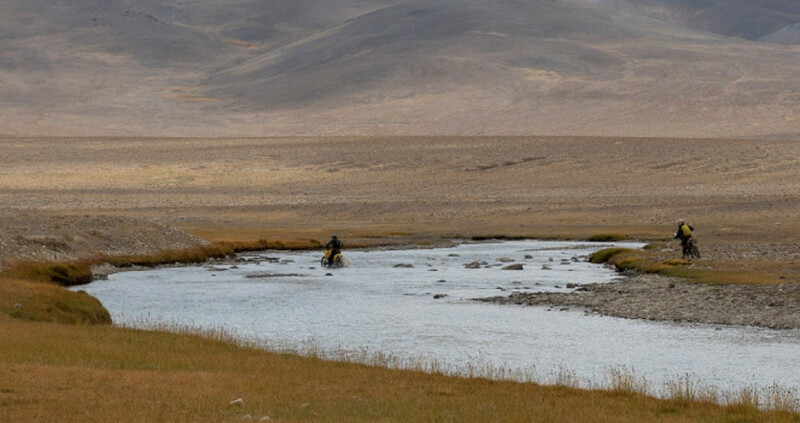 The riding is endless and challenging. People are as friendly as anywhere you will go. 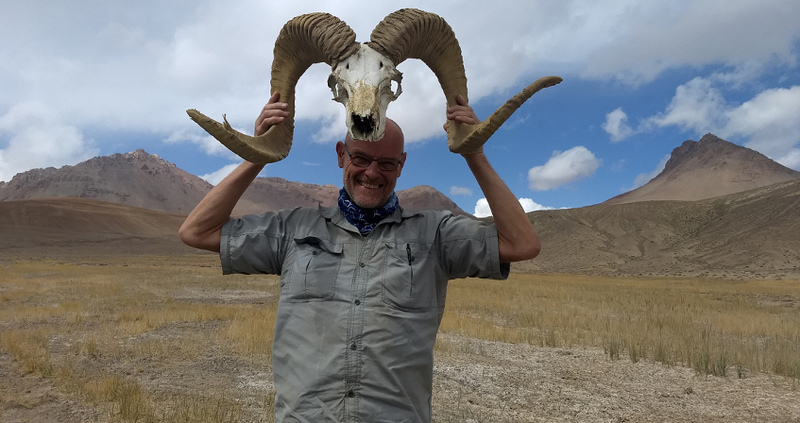 We spoke to some Austrian guys who had just been to watch the World Nomad Games that took place in another part of Kyrgyzstan. It sounds like a very feasible destination in the next year or so. 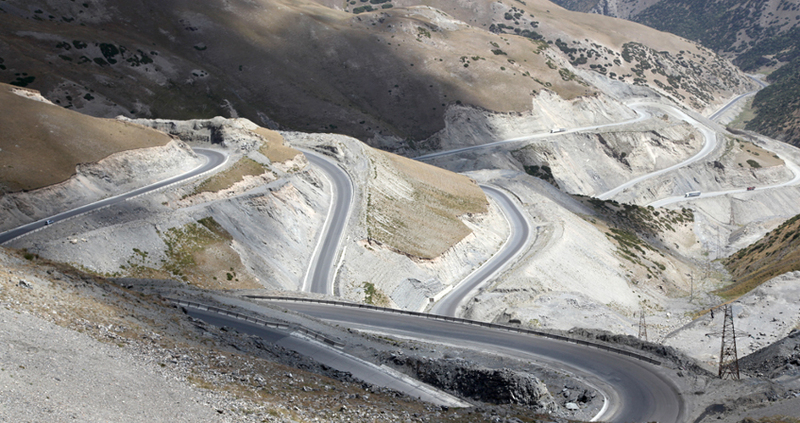 To do this trip, you need a degree of off-road experience. But, more important, is the ability to rough it a bit. The days can be long and hot; always dusty - very dusty. The nights can be cold. Comfy chairs are few and far between and toilets can be, shall we say, basic, or even non-existent. Food is also basic, as the people who live in this region are so limited with finance and infrastructure. 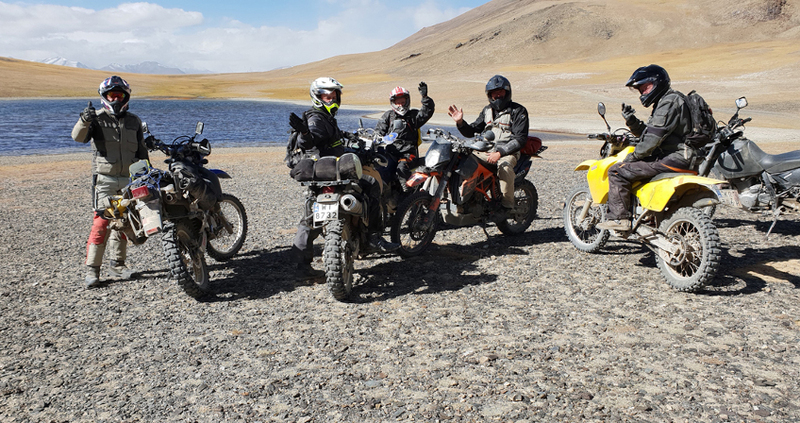 However, the sites, sounds and encounters far outweigh the minor hardships, and did I say the riding is absolutely the best? If anyone wants to know more, get in touch at news@wemoto.com, or check out advfactory.com.